Lupe Impala, El Chavo Flapjack, and Elirio Malaria love working with cars. You name it, they can fix it. 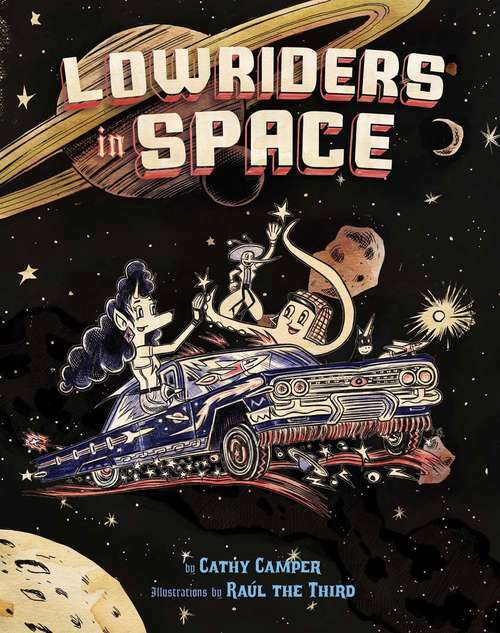 But the team's favorite cars of all are lowriders--cars that hip and hop, dip and drop, go low and slow, bajito y suavecito. The stars align when a contest for the best car around offers a prize of a trunkful of cash--just what the team needs to open their own shop! ¡Ay chihuahua! What will it take to transform a junker into the best car in the universe? Striking, unparalleled art from debut illustrator Raul the Third recalls ballpoint-pen-and-Sharpie desk-drawn doodles, while the story is sketched with Spanish, inked with science facts, and colored with true friendship. With a glossary at the back to provide definitions for Spanish and science terms, this delightful book will educate and entertain in equal measure.